A lot of gun owners wonder it’s like to own a fingerprint safe. The Barska Extra Large Biometric Rifle Safe is the perfect answer to that questions and more. Safety is the primary reason people choose to own guns. However with great power comes great responsibility. It is up to gun owners to maintain their firearms from falling into the wrong hands. Whether those hands belong to large knowing bodies, or tiny innocent ones. This safe will make sure only verified users have access to its sensitive contents. The Barska Extra Large Biometric Rifle Safe is the largest of its kind. Available with state-of-the art biometric technology. Biometric technology allows people to use their own unique human characteristics to secure items. In the case of this product, this safe happens to use fingerprint technology to ensure that its contents are protected. The safe allows for up to 120 different fingerprints to be stored in its memory base. Based off our experience here at TossTheKey, and people who own the safe, it is very easy to program. If you live in an area with high crime rate, or just want to be able to access your guns in a flash, you’re in luck. The safe has Silent Access Mode in case you want or need to access your firearms quickly and without making noise. The safe itself weighs 139 pounds. Making it light enough that a single man can move it. If this is a concern for you, it comes with 6 pre-drilled holes that allow it to be anchored to the floor. Or the wall if that’s what suits your needs. The Barska Extra Large Biometric Rifle Safe is made from steel. Painted Jet Black, it will be a safe you can keep in the open, if you don’t have the space in a confined area. It is lined with a soft carpet in its interior. Ensuring you won’t have to worry about your guns receiving damage from sitting on a hard surface. The safe contains a removable 16-position rifle rack as well as three removable shelves. As far as gun safes are concerned, biometric is the way to go. It is a quick to access, safe for at home and efficient. Additionally, this Barska safe has passed all of the meticulous testing done by the California Department of Justice. The safe comes with an external battery pack. In case the batteries in the interior pack run out. It also comes with two extra keys as back up. These can open the safe manually. The Five Point Deadbolt System used to ensure the safe stays locked 24/7, is made of one-inch solid steel. When you buy the Barska Extra Large Biometric Rifle Safe through Amazon, it comes with a 1 year Limited Warranty. The Barska Extra Large Biometric Rifle Safe is a great choice for Biometric guns safes. 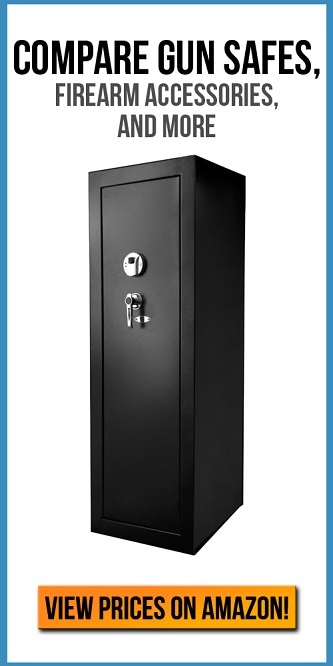 The safe is constructed with high quality steel. It’s built to last. With its large spacious inside; even the largest gun collections will be able to fit inside of it. Barska did not cut any corners on the safe. The extra keys and 120 possible identities will make sure you’re never locked out. And the people that aren’t allowed inside, will stay outside. Free shipping is also included on the safe when you buy through Amazon. If you were to choose to open this safe with a key, you are able to do that as well. Proper gun storage is an important part of being a responsible gun owner. This safe will ensure that your guns and your valuables are stored securely.